A vegetarian twist on a pub food favorite that kids and adults will love. Even if they don’t imitate fish exactly, they do have the right light feeling and with a squeeze of lemon on top and dunked in tartar sauce it all feels rather convincing. We have created the recipe so that the potatoes are baked at the same time as the ‘fish’, which is also very convenient. Make a double batch of the cauli ‘fish’ so you’ve got an extra portion in the freezer for lucky days. Preheat the oven to 200ºC (400ºF/Gas mark 6) and line 2 baking trays with parchment paper. Heat the oil for the cauli ‘fish’ in a large frying pan (skillet) on a medium-low heat. Finely chop the onion, leek and garlic, transfer to the pan and sauté for about 15 minutes or until the onion and leek have softened. Remove from the heat and set aside. Meanwhile, roughly chop the cauliflower, transfer to a food processor and blend until the texture resembles coarse breadcrumbs, then set aside. Grate the courgette (zucchini), squeeze out the excess water (you should end up with about 130 g / 4 ½ oz / 1 cup of grated courgette) and set aside. Crack the eggs into a large mixing bowl and whisk until the yolks and whites are combined. Add the sautéed vegetables, cauliflower, courgette and the rest of the cauli ‘fish’ ingredients and mix until combined. In the meantime, roughly chop the capers and transfer them to a small mixing bowl. Add the rest of the tartar sauce ingredients, season with salt and pepper and mix until combined. 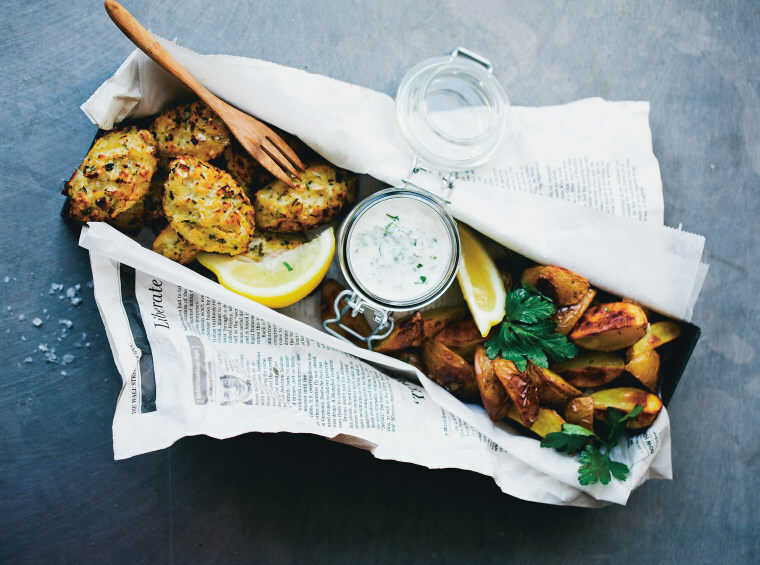 Serve the cauli ‘fish’ accompanied by some chips and topped with a dollop of tartar sauce, scattering of parsley and squeeze of lemon juice.